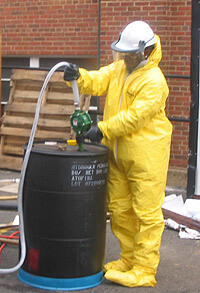 Hazardous wastes are substances with the potential to be harmful to humans or the environment. They’re often manufacturing by-products, but hazardous wastes can also be discarded commercial products. The Resource Conservation and Recovery Act (RCRA), Subtitle C, regulates the disposal of hazardous waste in the United States according to four lists. F-list wastes have non-specific sources, while K-list wastes are source specific. P-list and U-list wastes both come from discarded commercial chemical products, with P-list wastes presenting an acute hazard.